The extraordinary #1 bestseller - a word-of-mouth literary phenomenon 'Do not read this book in public: it will make you cry' Anne Enright 'Every line pulses with the pain and joy and complexity of an extraordinary life' Mark O'Connell 'I am afraid of being the disruptive woman. And of not being disruptive enough. I am afraid. But I am doing it anyway.' 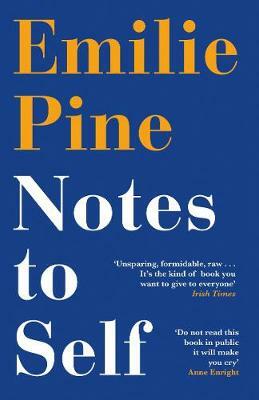 In this dazzling debut, Emilie Pine speaks to the business of living as a woman in the 21st century - its extraordinary pain and its extraordinary joy. Courageous, humane and uncompromising, she writes with radical honesty on birth and death, on the grief of infertility, on caring for her alcoholic father, on taboos around female bodies and female pain, on sexual violence and violence against the self. Devastatingly poignant and profoundly wise - and joyful against the odds - Notes to Self offers a portrait not just of its author but of a whole generation.